For six years, I’ve trained newborn photographers by taking the knowledge I’ve gained from other experts, applying my own creativity, and always continuing to perfect my craft. 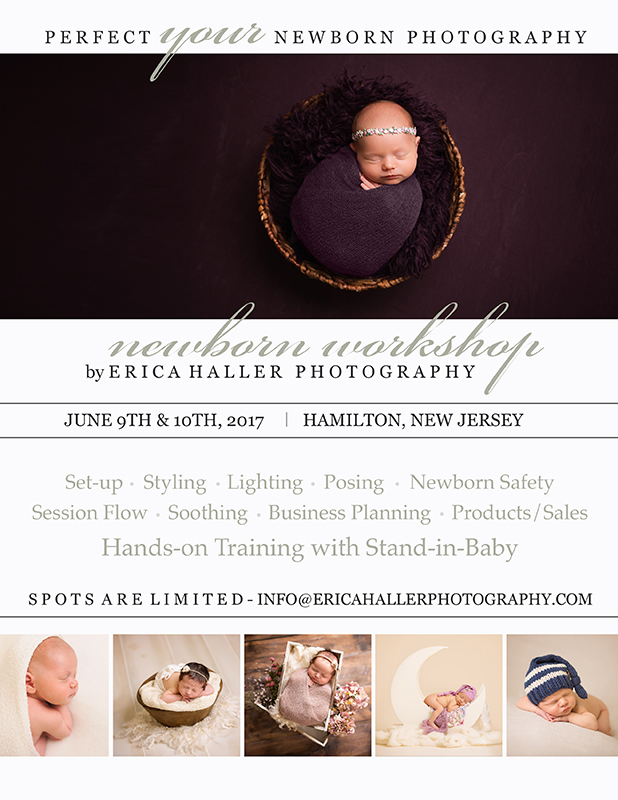 Spots are limited, so call us at 609.903.2001 or email info@ericahallerphotography.com with questions or click here now to grab your place in this exciting workshop. Two trained, professional newborn photographers, myself and Teri, will be there to make the already small class, even more individualized and maximize your learning opportunities. We are excited to have hands on opportunities for you to master posing and wrapping with the Stand-In Baby. Plus, there will be lots of goodies, give-a-ways and discounts from our favorite vendors and workshop sponsors! The total tuition for the two-day workshop is only $875.